Unlimited PTO is gaining popularity – and for good reason. It’s easier to administer and it removes the financial liability for accrued PTO that you might otherwise carry on your balance sheet. The financial benefits alone are intriguing, not to mention being able to take a permanent vacation from tracking each and every employee’s accrued PTO. But before you run off and make a change, you need to understand that moving from accrued paid time off to unlimited PTO doesn’t relieve you of all your human resources responsibilities. And you’ll want to be very thoughtful in how you make and manage the change. Read on to discover some lessons learned from those who’ve taken the plunge. Spend ample time before announcing the transition to anticipate the questions and concerns your staff will have and develop answers that are fair and consistent. Pay particular attention to the questions above. Determine if you’ll pay out unused PTO under your previous policy when you make the switch. If you opt not to, be sure to communicate well in advance about the change and provide ample time for employees to use accrued PTO before they lose it. You may also consider offering only certain employees unlimited PTO. Some companies offer it to exempt employees only given the legal issues surrounding overtime for nonexempt workers. Should you go this route, take extra time to develop communications that clearly state the policy and minimize any feelings of resentment from those that aren’t eligible. And realize that you’ll be off the hook for tracking time off for certain employees, but you’ll still have to administer a separate policy for the others. 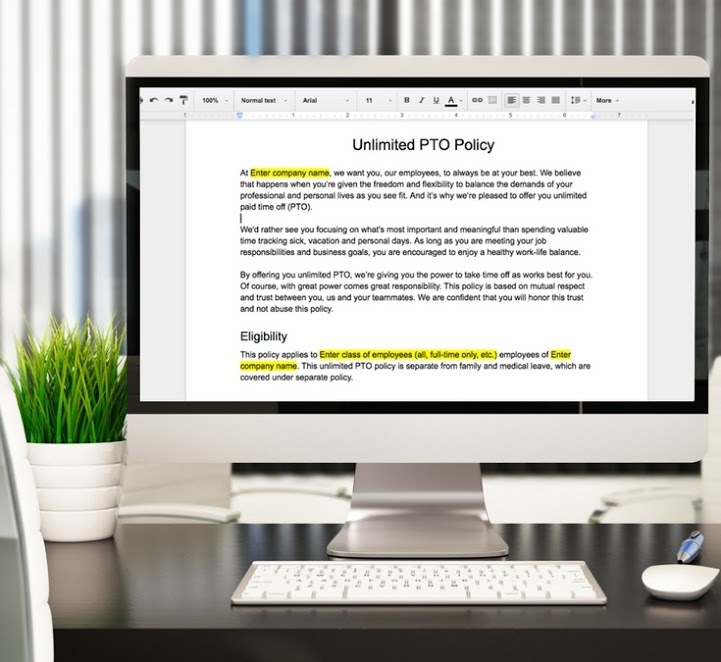 While the vast majority of employees will take about the same amount of vacation under your unlimited PTO policy as they did before, you still have to be diligent about ensuring that no one takes advantage of the policy. Taking off every Friday shouldn’t be Bob’s default…unless he’s run it by you and his supervisor, and he’s performing up to expectations. You’ll want to seek regular feedback from managers and department heads to identify and monitor any potential abuse or disruptions in productivity. You’ll also need to have a clearly defined disciplinary plan for how you handle these types of problems. Communicating specific guidelines about what is and isn’t allowed will reduce the likelihood of abuse. For example, even with unlimited PTO, you can – and should – reserve the right to deny time off requests. You should also maintain a request process that requires employees to submit their time off requests to you in advance whenever possible. Additional guardrails might include requiring that employees check for time off conflicts with other teammates before making a request, as well as identifying or coordinating with someone to cover for their absence. Your PTO software will be tremendously helpful here. This is also a great opportunity to step up goal setting for your employees, particularly if you’ve been lax in this area to date. Define and formalize specific performance goals and metrics with each employee, and check in often to monitor results. Detail and communicate the measures that will be taken if an employee falls short. The key to minimizing issues is ensuring that there are checks and balances. That way, Bob can’t go MIA for three weeks without telling anyone and without consequences. Formal written procedures and expectations provide the documentation and support you’ll need should an employee need to be reprimanded or disciplined for abuse or related performance problems. While employees usually love unlimited PTO, managers can be harder to convince. The traditional idea of productivity is based on a 40-hour workweek and placing controls on how much time employees spend at their jobs. The concept that employees can be entrusted to do their jobs at the same level without these controls can cause skepticism and concern. Shifting to unlimited PTO also means shifting your mindset. The focus needs to be on performance and results, not on punching the clock. The key lies in having clearly defined and agreed to standards of conduct and performance expectations. When you employ a results-based employment model, with clearly defined goals and consequences, performance issues will be obvious and disciplinary measures will be clearly spelled out. You may think that granting your employees the responsibility for managing their own time off would be met with cheers and celebrations. But you may find that you get more questions than high-fives. Employees are often skeptical about how unlimited PTO works. They think there must be some catch, so they’ll have lots of questions to make sure it isn’t too good to be true. Some employees may worry that there’s some secret scorekeeping they’re not aware of. Or that they’ll be penalized somehow if they actually take time off. Over communicate the policy and the expectations, both formally and informally. Help employees understand what the expectations and parameters are, even if they seem quite simple. Even if employees don’t have to formally ask for time off, you still need to ensure that there aren’t bottlenecks to productivity because of one or more employees’ absence. Ideally, you’d prefer it if just one employee in a department took time off at a time so that the others don’t suffer under the strain of his absence. This is another good reason to formalize expectations about the employee’s responsibilities when requesting time off. You can build this into your PTO policy, stating that if an employee wants to take time off, he either has to complete his work ahead of time or have a plan for who will handle it while he’s gone. Additionally, you need to deal with important company deadlines and typical busy times. Consider implementing blackout dates (when time off is prohibited) to ensure that you have all hands on deck during these critical times. It may take time for you to be able to assess whether or not your unlimited PTO policy is successful. Stay tapped into productivity levels. If productivity levels are at or above what they were before, and projects are being completed on time, your policy may be working well. Assess employee satisfaction both before implementing unlimited PTO and after. Conducting employee satisfaction surveys is a simple and easy way to see how the change is affecting your staff. Your employee retention is yet another. Finally, monitor customer satisfaction. Have there been increased complaints or have you lost customers since implementing unlimited PTO? If things are status quo or even getting better, then you can rest a little easier. Unlimited PTO works better for some companies than others. It tends to be popular in startups and fast-growing companies, as well as technology businesses that are project-oriented and want to offer an innovative culture and benefits. Should you decide it’s right for you, being thoughtful and thorough in your implementation can ensure your switch is successful. FREE unlimited PTO policy template to find out. Would unlimited PTO work for your company?